That time of year has come around again. And so quickly! The time to reset, redesign and reassess where you’re at and where you’re going! It’s a time where we think about and plan our New Years Resolutions or New Years Goals! We all know we can set new goals at any time, but for some reason we’re all drawn to the idea of ‘New Year, New Me’. Goal setting can be a powerful way to transform, motivate and achieve what you desire. However, there’s almost an art to goal setting, because to truly accomplish your goals you need to start with the correct goals. Write, draw, sketch or paint your draft goals. By brainstorming (in whatever way works for you) it allows all of your thoughts and ideas to land on a page. That means they’re OUT OF YOUR HEAD! They are now physical and visual. 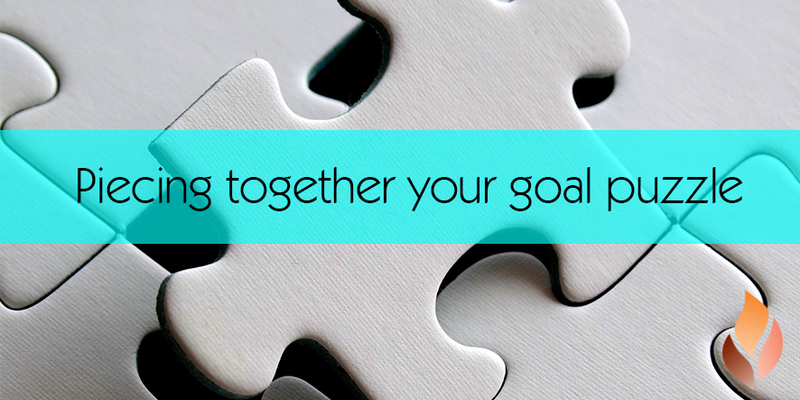 Like a puzzle, you can now piece them together to create the vision you want to achieve. Let’s take one of the most common goals – to lose weight. It’s great to say, but how are you going to continually motivate yourself to achieve this? Often we need a source or reminder to keep us going when times are tough. Here’s an example of a motivational source: take a full body picture of yourself wearing only your underwear and holding a recent newspaper or magazine (to show the date). You may want to add a caption such as “it’s time to change” and also your current weight. Print this off and stick it somewhere you will see it everyday. It’s a reminder to yourself that you’re on a new path and you don’t want to go back. If you say, “I want to lose weight”, this isn’t very specific. It’s important to make your intentions to the point and to a deadline, such as “By 31 December 2016, I want to weigh 70kgs”. Don’t set yourself up to fail! Goals are written to be achieved, so don’t make them unrealistic and unachievable! Read and review your goals as often as you can; whether it be every day or every week. This will keep them fresh in your mind. Don’t be afraid to refine your goals either – our lives and circumstances are constantly changing, so sometimes improvements and alterations to our goals can be advantageous! Tip: write your goals on sticky notes and put them around your home – bathroom mirror, fridge etc. You could even put up a picture of how you see yourself looking! Most importantly – relax! If you start falling off the bandwagon, don’t worry about it, get right back on it! If you don’t achieve your goals, don’t be too hard on yourself! Review and redo your goals so that you keep moving forward. Setting your reward is just as important as setting your goal. Make sure you give yourself more than a pat on the back once you’ve achieved your goal. Maybe you’ve always wanted to go skydiving or perhaps you could treat yourself to a massage. Whatever you choose, make sure it’s enjoyable and something that will be AMAZING for you!